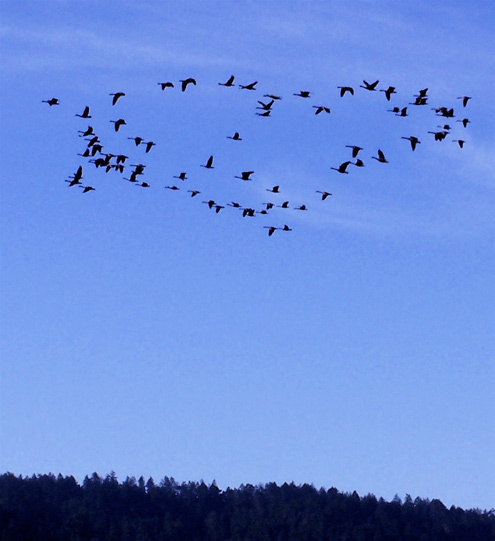 While on the topic of hearts, here is my annual Valentine’s Day greeting from a flock of Canada geese flying over Inverness Ridge, as seen from my deck. Romantically inclined gentlemen have traditionally given their ladies flowers for Valentine’s Day. 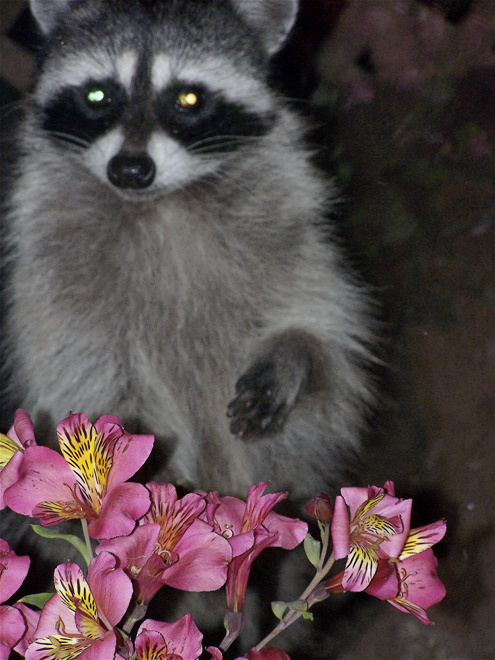 Here Mrs. Raccoon, who works part time at Flower Power in Point Reyes Station, shows off a particularly nice bouquet. How men respond to feminine beauty is to some degree, of course, a matter of culture, as we could see when an attractive young woman dropped what she was carrying during the G8 countries’ summit in Canada last June. Canadian Prime Minister Stephen Harper was too preoccupied with his own appearance to notice, and President Barack Obama remained all business while French President Nicolas Sarkozy and Italian Prime Minister Silvio Berlusconi admired her comely derrière. By the early 1800s, Valentine’s cards were being assembled in factories, and with the development of modern printing in the years that followed, printed messages replaced handwritten notes. 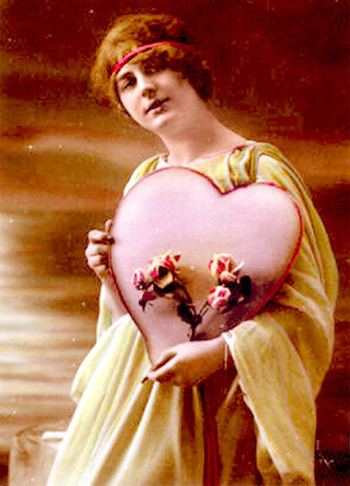 The woman holding this large, pink Valentine was photographed about 1910. There must be something trippy about this time of year. If you’ve never experienced an acid trip, the following kenesthetic hallucination will give you an idea of what it’s like. Here’s what to do: click on the link at the end of this posting, then “click me to get trippy,” then stare at the center of the screen for a full 30 seconds, then look at your hand holding the mouse without moving it away from the mouse. You’ll be amazed at the result: Happy Valentine’s Day! 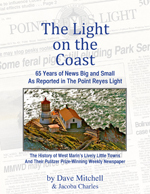 Sparsely Sage and Timely is powered by	WordPress 4.9.10 and delivered to you in 0.500 seconds using 52 queries.